Me too...I am also a Michael Innes fan-girl...I read most of his books when I was younger. Thanks for the review and reminder, maybe I will read a few again. Your love of Michael Innes has affected me. In the past month, I've found a handful of Innes paperbacks in thrift stores. Before reading your reviews, I may have passed them up. But now, I buy every Innes book I run across! Now, to find time to read them! Good for you, George! I've been buying them from Abe Books online for a while now - really inexpensive and free shipping. Can't beat that. But I'd rather have bought them in a used book store or thrift shop. Alas, nothing close by where I live now. Pull my finger, sweetie, go ahead hee hee hee. Not heard of Michael Innes, but...after this, how can I not head immediately for the hare hole? Ha! As you please, Mathew. I recommend Michael Innes to anyone who enjoys language and its various uses, not to mention. literary bon mots by the dozen. 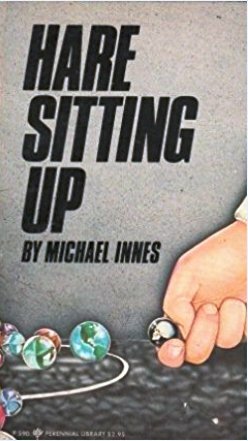 Though I'd read a couple of other Innes titles and enjoyed them way back when, a few years ago I read 70 pages of a paperback edition of HARE SITTING UP and yours truly gave up. Given the story's urgent premise (do tales like THE SATAN BUG ring a bell? ), the novel's approach seemed much too casual and, ultimately, tedious. Another Innes novel, APPLEBY AND HONEYBATH, has languished on my shelves for years, so if I eventually get to it, I can only hope it'll be more satisfying--and that I'll get all the way through it! I'm with you, Muddy. (If I may call you that.) :) He really is unique. No one wrote quite like him or concocted such outlandish plots in the name of 'thriller'. And I don't even mind that half the time I don't know or get the literary allusions because eventually I figure it out or if I'm stumped enough, I go look it up. Innes makes me think - not a bad thing. So, is this book funny? When I read about the wacky aristocratic ornithologist, I started laughing. Is the whole book like this? I say this because while I'm glued to MSNBC, the scene in D.C. just gets grimmer and grimmer. Now we have to deal with Gorsuch, a Bannon pick, who wants to roll back every gain and right about 80 years, even more. So, I need humor. I thirst for it. Someone today suggested books by Dave Barry and David Sedaris. I may have to resort to humorous books. And there's Carl Hiassen, too. Wacky Floridians seem to be in constant supply in Barry's and Hiassen's books. Just what I need. No this is not the book to be reading now, Kathy. If I were you and I wanted amusement and chuckles and the occasional laugh out loud moment, I'd try Jeffrey Cohen for a whole slew of funny mysteries. He also writes under the name of E.J. Copperman. I'd also try Parnell Hall's Stanley Hastings books. Mysteries with laughter are unbeatable combo. And for more civilized stuff, I'd try the books of English author Angela Thirkell. I'm currently reading as many of her books as I can find online and loving them to death. VERY dry wit mixed with laugh out loud moments. English wit, to me, is often hilarious. The books mostly take place before and during WWII. She is an absolutely WONDERFUL observer of human frailty. She is a snob though, writing from the point of view of high social standing, but that doesn't bother me in the least. I'd also try the Mapp and Lucia books by E.F. Benson. HILARIOUS. Also English, but wackier than Thirkell. Last but not least, I'd try the Robin Hudson books by Sparkle Hayter (yes, that's her real name) - there aren't that many but what there are, are choice. Also HILARIOUS in a totally American way. The kind of books which you have to be careful reading in public, because people will stare if you being howling. Ha. Also, I believe, the main character lives in or near Greenwich Village. Check these out, Kathy - see what you think. Let me know. Years ago I did read a book by Parnell Hall, the first in the series probably. And I did read a book by Sparkle Hayter set in the Chelsea Hotel near my residence. Haven't tried Thirkell, but I think the social snobbery would irk me. I could try the E.F. Benson books. But I think I will try the Barry and Sedaris books, or one by each. And one more of Hiassen's. Amd there's always going back to the West 35th Street brownstone to dine with Nero, Archie and Fritz. Always fun. And I do like British wit. My father was from an Irish-English family and he had dry wit, was often cracking jokes or one-liners, and he loved humor. I'd hear him late at night laughing over a book he was reading. And he introduced me to the Goodwin/Wolfe gang. Well, whatever you decide to read, I hope you'll find some relief from the day -to-day of political chicanery and the repellent individuals now running our country. You might not like to hear this, but I only read about half a dozen of Innes' mystery novels and have been criminally neglecting him for many years now. Something I should rectify in the near future, because I have roughly twenty of his books on my never decreasing TBR-pile. In my defense, I absolutely loved Lament for a Maker and remember thinking Death at the President's Lodging was one of the strongest debuts from the Golden Age. I noticed you were missing from my blog-roll, but you're added now. Half a dozen is better than nothing, TomCat. :) LAMENT FOR A MAKER is not one of my favorites, but I know I'm in the minority there. I'm more fond of Innes' flights of fancy books. Ha. And thanks for adding me to your blog-roll. I hope you keep reviewing books by Michael Innes, to remind me that I must read some of his books. I did read many of them when I was younger, and liked them. Hello Yvette, now I have to say that I have never read MI but what made me want to post a comment was the book cover because it took me right back to my school days, playing marbles. A lot of fun (if one was winning) and a lot of angst (if one was not winning). I still have my marbles (!!) in the bag that my grandmother made me with its green drawstring. You have given me a very nice memory. Bye for now, Kirk. We aim to please around here, Kirk. Comments - no matter the reason - are always welcomed. Thanks for dropping by. I thought I'd responded to this before, but maybe I didn't. Anyway, I just bought this book and after reading your review, it moves to the top of the TBR pile. I hope you enjoy it, Joan. It's an odd book, but that's what I like about it. Yvette, if you're such a big fan of Michael Innes, then it's about time I picked up at least one of his paperbacks and read it. I admit passing up fairly large quantities of his books in secondhand book exhibitions. Oh my goodness - DO NOT PASS THEM UP!!! Not all his books are great, of course, but MOST OF THEM ARE WONDERFUL. He is one of my very favorite of the Golden Age British writers. He is unique - not one else writes like him or thinks like him or plots like him. He takes getting used to, yes, but once you're hooked on his style, you'll want to read everything. Of that I'm sure. If you see THE CASE OF THE JOURNEYING BOY or OPERATION PAX or SHEIKS AND ADDERS or THE SECRET VANGUARD or FROM LONDON FAR or HARE SITTING UP or THE MAN FROM THE SEA or THE OPEN HOUSE or SILENCE OBSERVED or DEATH ON A QUIET DAY or THE CRABTREE AFFAIR - grab them. Or for that matter, any other Innes. Tastes vary and you may like some others I'm just lukewarm about. Happy reading! I will, Yvette. Thanks for the recommendations. This makes it easy for me. I finally received a copy of Michael Innes' HAMLET, REVENGE! from the library. I had to go through InterLibraryLoan to get it. It was rather surprising to find that the book had come from the Juneau Library! I guess that explains why it took over three weeks to arrive. Those dog sled teams don't do too well, I guess, in the desert heat. Ha! Too bad the dogs can't deliver the book to your door. :) I usually just buy them from Abe Books since most Innes books are available for about 3.50 and free shipping. I have a nice stack of them. But then, I reread them all the time, so it works better for me.